There's a good chance that if you're an HIM professional who's attended major conferences held by organizations such as HIMSS and AHIMA, you've had the pleasure of attending an education session hosted by June Bronnert, RHIA, CCS, CCS-P. The veteran industry leader, a staple on the Ohio HIM scene, has enjoyed a long and storied career, rising through the ranks to become AHIMA's director of professional practice resources before joining Intelligent Medical Objects (IMO), a developer of medical vocabulary-enabled products. As IMO's director of terminology coding, she's responsible for ensuring accurate code mappings, including ICD-9-CM, ICD-10-CM/PCS and CPT-4/HCPCS. For The Record (FTR) had the chance to pose a few questions to Bronnert to get her take on various issues affecting the coding arena. FTR: What do you view as the biggest challenges facing today's coding managers? JB: Qualified employees to perform high-level job functions. The health care industry has evolved, and the complexity of the many tasks has increased over time. Faster-paced work environments (in general) and technology advancement—both clinically and administratively—have moved the needle of "fundamental competencies" for employers. Robert M. Wachter, MD, spoke at the AMIA 2015 national convention of a bridge built to withstand hurricanes and other natural disasters over a river. A hurricane hit the area. The bridge remained stable in the aftermath. It was discovered the current bridge was ineffective to cross the river, as the river had moved. The river of coding competencies has moved for many reasons and it's time for collaboration to build a new bridge of core knowledge for coding professionals. FTR: From all accounts, the transition to ICD-10 has gone well. Do you agree with that assessment? If so, to what do you attribute the smooth transition? JB: Yes, by all accounts the transition has gone well. Industry collaboration such as provider-payer testing was important to facilitate a smooth transition. Using the ICD-10-CM/PCS prior to go-live facilitated "demystifying" the code systems for individuals. FTR: Has anything surprised you about the transition? JB: The perception that "unspecified" codes are inappropriate to use in certain situations. There are times when providers do not know all the details of a clinical condition for one to assign a more specific ICD-10-CM code. Settings such as emergency departments provide an example where providers may have more details regarding the acute condition vs the patient's past medical "stable" conditions. Even the acute condition may still be clinically unfolding so the emergency department provider does not have additional specificity to document. The providers must document what is known at the time of the patient's encounter. 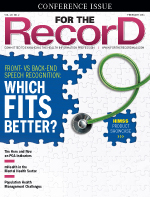 FTR: Following the move to ICD-10, how do you recommend providers monitor their case mix index? JB: The fundamental principles remain for monitoring case mix following the transition to ICD-10-CM/PCS: knowing the Medicare severity diagnosis-related groups (MS-DRGs) and their respective weights. The difference due to ICD-10-CM/PCS implementation is knowing how the changes between ICD-9-CM and ICD-10-CM/PCS impact code assignment and their respective MS-DRGs. For example, MS-DRGs 312 Syncope & Collapse and 313 Chest Pain have the same MS-DRG numbers and titles in the fiscal year 2014 version of the MS-DRG system and ICD-10-CM/PCS MS-DRG version 32.0. The question is what ICD-10-CM codes are in the two MS-DRGs and is there a change in coding guidance between ICD-9-CM and ICD-10-CM impacting code assignment. Reviewing the MS-DRG information provided by the Centers for Medicare & Medicaid Services is important as providers prepare to monitor their case mix index with ICD-10-CM/PCS. FTR: With an array of software solutions available, how do coding departments avoid becoming too reliant on technology? JB: Everyone is reliant on technology today. Youth do not know a world without technology. Think of all the areas in which technology impacts your life, from how you are entertained to how you perform your job. It's when we lose the ability to see the technology as a tool or when technology overpowers the workflow that we can become too reliant on a system. Integrating technology to balance and support new, more efficient workflows where end users are still required to apply core fundamental knowledge is important. A recent shopping trip with my daughter demonstrated this idea. We were paying for our purchases using a gift card for a portion and cash for the remaining balance. The cashier stated the total amount due. I swiped the gift card. The remaining balance of approximately $12 appeared on the screen. I handed her $20. She entered the information in her register, looked at me and said I still owed her $8. It's obvious as I retell the story that the store owes me change, but at the time it took a few minutes for the cashier to realize there was a mistake with the register's output as I politely said, "No, I don't owe more money." I then turned to my daughter and said, "This is why you must know basic fundamental math facts." Core fundamental knowledge is key to avoid becoming too reliant on technology. For example, knowing ICD-10-CM rules and guidelines are fundamentally centered on classification of diseases is key when assigning ICD-10-CM codes. It is important for each profession to define their core fundamental knowledge for the workforce. FTR: What are the biggest challenges in creating coding software for EMRs that are used by both physicians and coders? JB: I suspect one of the biggest challenges in creating coding software for physicians and coders is different perspectives and workflows. Physicians create and review the documentation to tell the patient's clinical story in their own words with the ultimate goal of restoring the patient's health. Coding professionals review the documentation to translate the patient's story into administrative coded values so the data are available for all desired secondary uses. FTR: What role do coders play in maintaining data integrity? JB: Data integrity holds different meaning to different people. Data integrity of the documentation and how the documentation is represented by an alphanumeric or numeric code value are two different areas where coding professionals have a role. FTR: We frequently receive e-mails from aspiring coders who say how difficult it is to land that first job. Do you have any advice for those job seekers? JB: Don't be afraid to start anywhere within an organization. Demonstrating one's work ethic and potential is not limited to a specific job title within an organization. Prepare for any opportunity by performing a self-evaluation to identify and articulate your strong points. When interviewing, provide specific examples of your strong points. Tell a potential employer how you are a problem-solver or an analytical thinker. Never underestimate the value in getting involved, whether it is shadowing an individual, internship opportunities, or volunteering. Volunteering with local, state, and national associations is one of the best things I've done for many reasons. Internships are important ways to demonstrate one's competencies. Even if a job opportunity is not available at the end of the program, you may gain an important résumé reference.